Benefit features comedian Dan Nainan with proceeds supporting BluePath’s mission. $25 ticket includes show and light snacks. Cash Bar, Raffles & Silent Auction. A dog and family friendly event with proceeds to benefit BluePath! More info here. The incredible turnout for our second annual walkathon was a true testament to the power of the BluePath community. Despite the torrential rains, more than 250 people joined us to raise funds and awareness - and to celebrate our beautiful blue path. To everyone who attended the walk, made a contribution, or simply contributed to the positive energy of the day - thank you. Together, we are unlocking life's potential for children and families touched by autism. 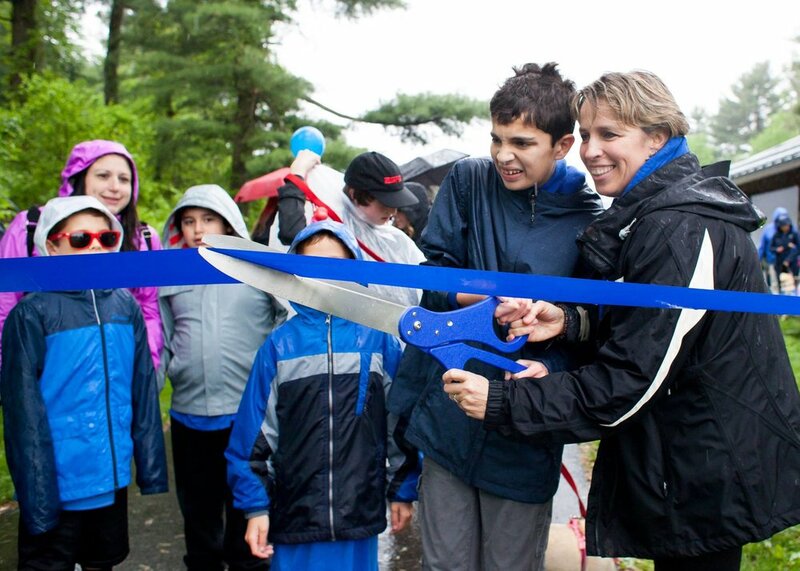 BluePath Board chair Tricia Zarro and son Danny cut the ribbon to kick off our second annual walkathon. Hope for Michael presents a comedy night featuring comedian Phil Selman. All proceeds support BluePath's mission of providing autism service dogs, offering safety, companionship and opportunities for independence. More info here. Thank you to all who joined us on the path to unlocking life's potential for children and families touched by autism. The walkathon raised funds in support of BluePath's mission to provide autism service dogs, offering safety, companionship and opportunities for independence. Our expertly trained dogs work alongside parents and caregivers to prevent wandering and keep children safe.